Gay and Terry Woods' final album 'Tender Hooks' has been rereleased by Cooking Vinyl. First released in 1978 this is it's first appearence on CD. If you don't know anything about the album you may want to read the review of it currently on Richard Hollis's Steeleye Span site. I had no formal notification of this (the rerelease of 'Tender Hooks') at all. Terry Woods rang me up and said did I know that this was out and he gave me the phone number of the record company and I've done nothing about it. You can see the kind of girl I am ! I think they picked one of the better ones to put out. I suppose they put it out because my career is on the move again. I think this was the last thing we did - Terry Woods and me. There is about five more. The other one Terry and I were discussing (which is my favourite) was the first one we did called 'The Woods Band'. I think that's a good album because there are a few people who think they did the first folk rock thing in Irish music but this would certainly prove they didn't. There is some lovely music, some gorgeous musicianship on it. This page lists all of Gay's back catalogue currently available. It doesn't list bootlegs or odd tracks such as the BBC sessions which appear on compilations. 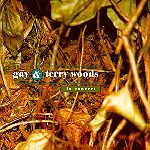 'Strange Fruit' and is not, strictly speaking, an official Gay and Terry Woods album. For that matter its not very 'in concert' either. Most of CD comes from the sessions the pair did in 1978 for John Peel on the BBC - ad hoc versions of songs mostly from the 'Tender Hooks' LP which, whilst being OK, are not as good as the original versions for obvious reasons. The rest come from a concert around the same period and aren't particularly well-edited. Gay tried to block the release of this album and still disapproves of it being available. Ironic really considering that the official LP's can't seem to get out of the Polygram vaults for all Terry Woods' attempts. available from 30.6.03 features the finest studio cuts from the first three albums for the first time ever on CD.